Rocket Readings: Good Reads for B2B Sales - Are You Drowning in Sales Quota? Good Reads for B2B Sales - Are You Drowning in Sales Quota? Keeping up to date on the latest innovations and opinions in sales can be time-consuming, especially in the the digital space. 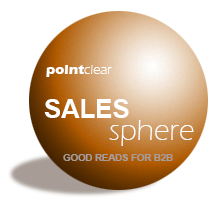 Sales Sphere features relevant blog articles from PointClear's online B2B sales circles. Will Google Glass Revolutionize Buying and Selling? Throw Me The Anchor, I Am Drowning!